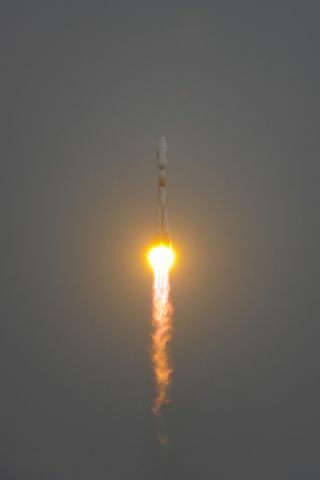 Soyuz lifts off for the first time from Europe’s Spaceport in French Guiana carrying the first two Galileo In-Orbit Validation satellites, on October 21, 2011. This story was updated at 10:04 a.m. EDT. A Russian rocket blasted off from Europe's spaceport in South America for the first time today (Oct. 21), lofting to orbit the first two satellites in a future European GPS network. The Soyuz rocket lifted off from its brand-new pad near Kourou in French Guiana at 6:30 a.m. EDT (1030 GMT) today, marking the first time the workhorse vehicle has ever launched outside the former Soviet Union. It carried skyward the initial two satellites in the Galileo constellation, a navigation system designed to end European dependence on the United States' GPS network. The launch was originally scheduled to occur on Thursday (Oct. 20), but ground controllers detected a glitch during the rocket's fueling. Operators were told to stand down for 24 hours as the problem was investigated. Today's successful launch was a big moment, as Europe celebrated the first of what it hopes will be many such Soyuz launches from South America. The Soyuz launch site at Europe's spaceport near Kourou, in French Guiana. Today's launch was the 1,777th of the Soyuz's long and storied career — but the first from anywhere beyond the old Soviet borders. Soyuz rockets had flown exclusively out of Baikonur in Kazakhstan and Plesetsk in northern Russia. But Arianespace wanted to bring the Soyuz, with its long track record of reliability, into the fold. So Russian and European officials signed a deal in 2003 paving the way for the rocket to operate from Europe's spaceport in French Guiana. The rocket gives Arianespane a dependable medium-lift vehicle to complement its heavy-lift Ariane 5 and the lightweight Vega, which is due to begin operations next year. Engineers carved a 300-acre (120-hectare), $550 million launch site out of the jungle near the town of Kourou, creating an equatorial twin of the Soyuz complexes at Baikonur and Plesetsk. And it was baptized by fire today. Today's launch came almost two months after a rare but high-profile Soyuz failure. On Aug. 24, the third-stage engine in a Soyuz shut down while launching the robotic Progress 44 resupply vessel toward the International Space Station, and the craft crashed in Siberia. Russian officials have since pinpointed the cause of the problem and instituted measures to prevent it from happening again. Regardless, the Soyuz that blasted off today is a different model that uses a different third-stage engine, Arianespace officials said. Adding to the historic nature of the Soyuz's first South American flight was its payload. The rocket carried up the first two Galileo navigation satellites, depositing them into circular orbits 14,430 miles (23,222 kilometers) above Earth's surface. Two more Galileo satellites will go up next year, and then many more will follow as the decade progresses. Eventually, the constellation will have 30 satellites. Galileo is envisioned as a super-precise European version of the American GPS or Russian Glonass navigation systems. While GPS is accurate to within about 10 feet (3 meters), Galileo should be able to pinpoint locations to within 3 feet (1 m) or so, European Space Agency officials have said. Europe has long wanted to develop its own satellite navigation system so it doesn't have to rely on the United States for this vital capability. Galileo should begin offering some services in 2014 and should become fully operational by 2020.